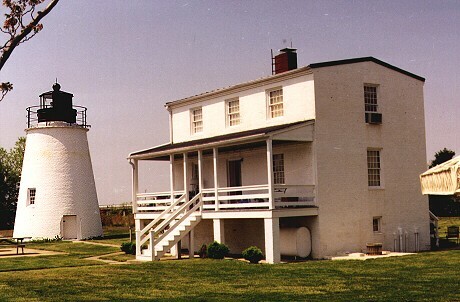 Piney Point Lighthouse – Chesapeake Chapter U.S.L.H.S. The Piney Point Lighthouse was built in 1836 by John Donohoo. Congress appropriated $5,000 in March of 1835 for its construction. In late December of 1835 2.6 acres of land were acquired from Henry Suter for $300. About 14 miles up river from the Point Lookout lighthouse, Piney Point is the oldest light on the Potomac River. The tower is 35 feet tall, much the same as the other lighthouses that Donohoo built, such as Concord Point and Cove Point. The tower is painted white with the lantern painted red. The interior of the tower is 13 feet at ground level and the wall at ground level is four feet thick. Just below the lantern floor, the interior is about seven feet in diameter and the walls are 18 inches thick. The interior spiral staircase is wood and in very poor condition. The original lighting apparatus consisted of 10 lamps with each in its own 15-inch reflector. In June of 1855 this was replaced with a 5th-order Fresnel lens which has since been removed. The light was decommissioned in 1964 and in 1980 the Coast Guard transferred ownership to the Saint Mary’s County Department of Recreation and Parks. The museum along with many volunteers have done an exceptional job of restoring the grounds, the lighthouse and the keepers quarters. The restored tower steps allow visitors a bird’s-eye view of the area during the Annual Piney Point Celebration held in May. Additional tower openings are announced when scheduled. The keepers house is rented out and the renters act as caretakers and watchmen for the property. The interior of the house (which is not open to the public) still shows signs of the former Coast Guard presence. From Baltimore/Washington, DC Area: Take 495/95 to exit 7a (Route 5 south to Waldorf). Follow Route 5 south through Leonardtown to Callaway. Turn right on Route 249. Drive 9 miles to Piney Point making a right onto Lighthouse Road for 1.4 miles to the end and the parking area for the lighthouse. From Virginia: Take State Route 301 to 234 east to Leonardtown. Turn right on Route 5 South through Leonardtown to Callaway. Turn right on Route 249. Drive 9 miles to Piney Point making a right onto Lighthouse Road for 1.4 miles to the end and the parking area for the lighthouse.